These records were created through fieldwork in Barbados in 2014 and 2015, as part of doctoral research completed in the Archaeology Department at the University of York and with the permission of the Anglican Diocese of Barbados. 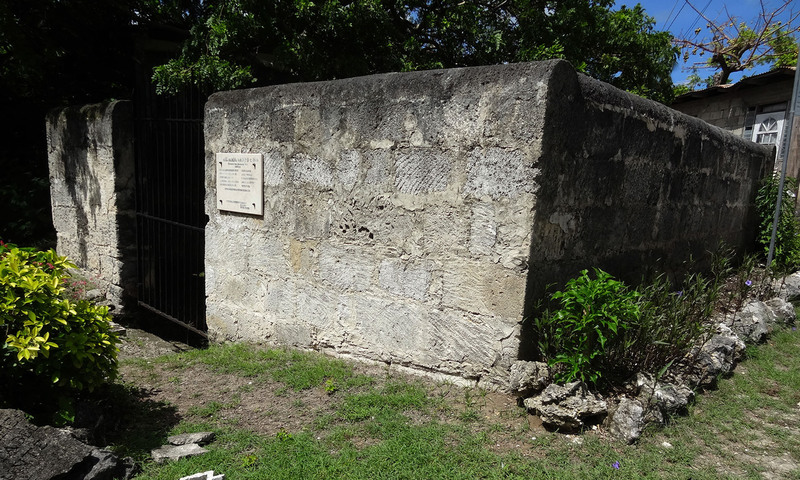 Archival records of monument inscriptions were also incorporated, originally accessed at the Barbados Museum and Historical Society. 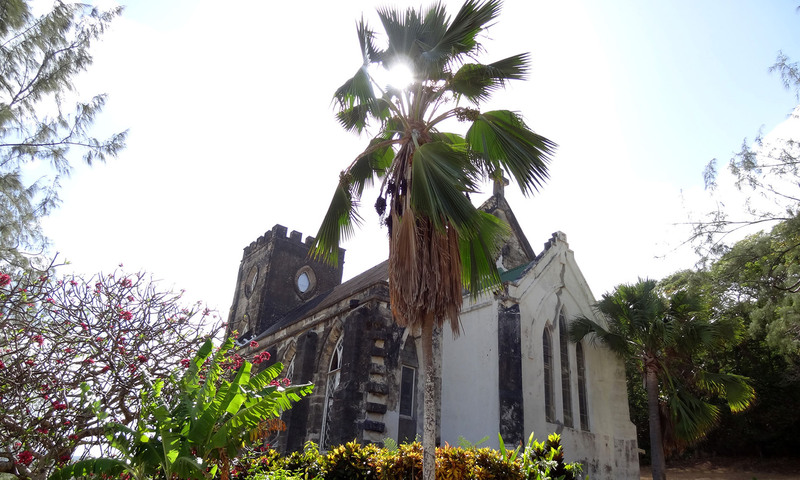 All of the monuments inside of and surrounding 16 Anglican churches in Barbados were recorded, alongside those at plantations. The entire record of monuments (including photos) is open to search and to download for free (for non-commercial use). For more information on the sites currently included in the records, see below. For more: Cook, K. (2015) New World Memory: Identity, Commemoration, and Family in Transatlantic Communities. PhD thesis submitted to the University of York. This church includes 48 monuments dating between 1666 and 1950, only 16 of which were recorded in 2013. Originally constructed as a ‘Chapel of Ease’ in 1649, All Saints was built in the area of Pleasant Hall, St. Peter’s Parish, for the convenience of parishioners who had difficulty travelling to St. Peter’s or St. James Parish Churches for services. Destroyed by the hurricane of 1831, the church is known for its stained glass windows. Most of these are tablets, particularly of granite and marble, with concrete curbs around single or double plots, and occupy the north and west sections of the churchyard. There are no mausoleums in this churchyard, however there are two examples of more elaborate chest tombs. Access to the interior of All Saints Chapel was not possible during the course of fieldwork, but earlier records have been used. 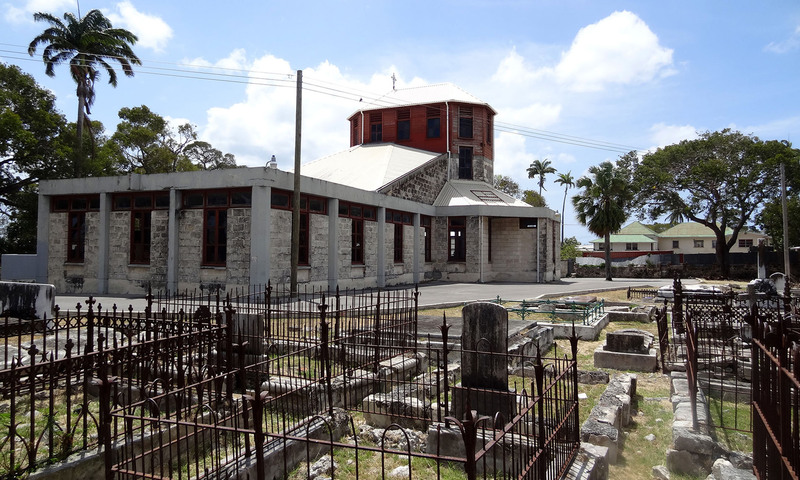 Overlooking Oistins’ Bay, the current Christ Church Parish Church had four predecessors, that latest of which was built after 1935, with 92 suriviving monuments. This includes a number of large mausoleums and crypts, in addition to smaller tablets on curbs outlining family plots, constructed from coral stone tablets, but also brick, granite, marble and other stone monuments. A large vault was also constructed during the cholera epidemic of the nineteenth century, since sealed with the simple engraving ‘Cholera’. The original churchyard wraps around the church, however a modern extension dating to the twentieth century was opened to the north (not recorded). Just north of Bathsheba on the eastern coast of the island, St. Andrew’s Parish Church was established in 1630, however the current church building date to 1846. Originating as early as 1650, 35 monuments from this churchyard were included in the study. However, only 16 were recorded during the period of fieldwork as a result of extensive monument attrition. The large churchyard is dominated by more recent monuments, primarily in black granite and white wooden crosses. The older sections of the churchyard are closest to the church, with many marble and concrete monuments, including many fragments of tablets. 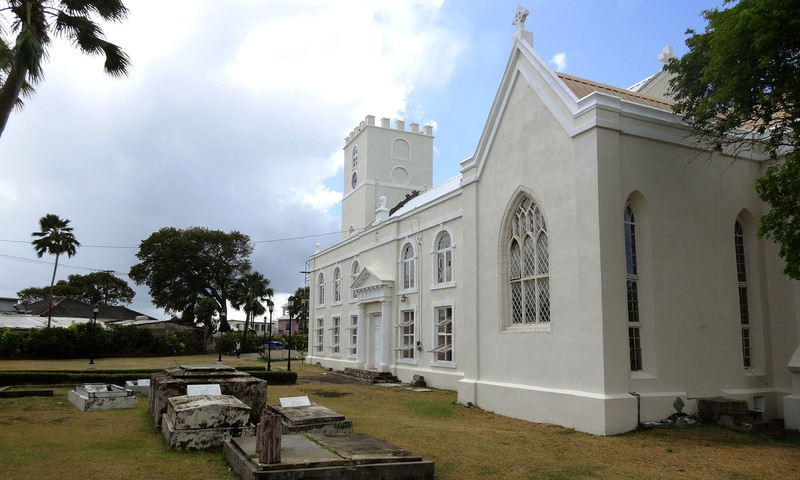 As with many of the churches on the island, the original St. George’s Parish Church (c. 1637-1641) was destroyed by the hurricane of 1780, along with all documentation and records. This study includes 140 monuments from St. George, dating as early as 1680. Twenty six monuments were recorded inside the church, including a range of sculptural wall tablets and simpler floor tablets. The churchyard wraps all the way around the church. The older sections include many white marble monuments on curbs and covered vaults. Very few mausoleums stand in the large churchyard, but large family plots and enclosures do pave the majority of the land between pathways. 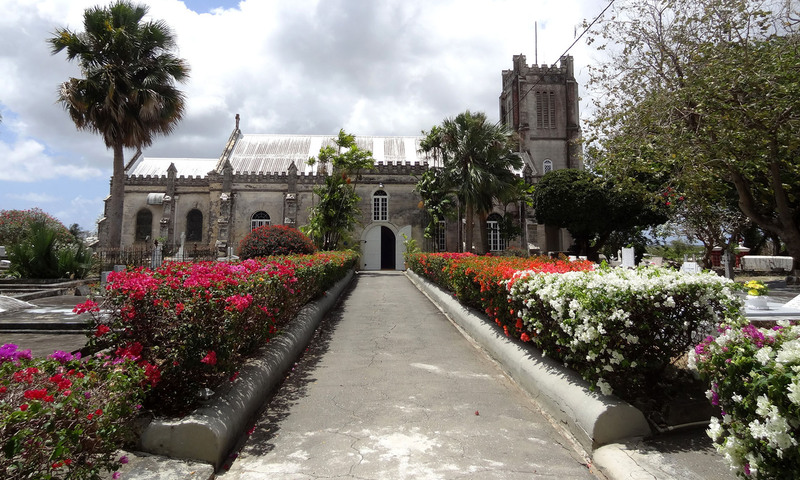 Located in Holetown (originally known as Jamestown), the original site of settlement, St. James Parish Church is heralded as the oldest church on the island. This study included 72 monuments, dated as early as 1669. Internal monuments range from small brass and marble wall plaques to large, ornate sculptural memorials. Outside, the existing monuments include chest tombs and vaults, of marble, concrete, and coral stone, with iron enclosures. 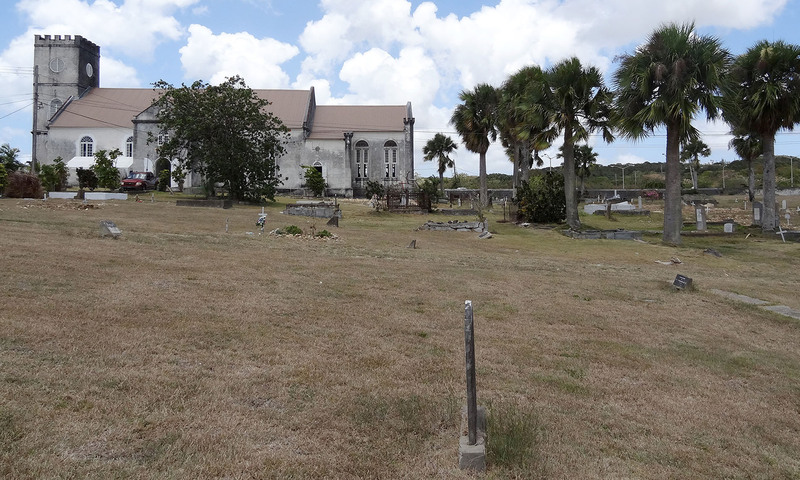 A large enclosure to the Alleyne family, an elite planter and merchant family on the island, is amongst the most notable and their descendants’ occasional visits to the parish church and the graves are much celebrated by the community. 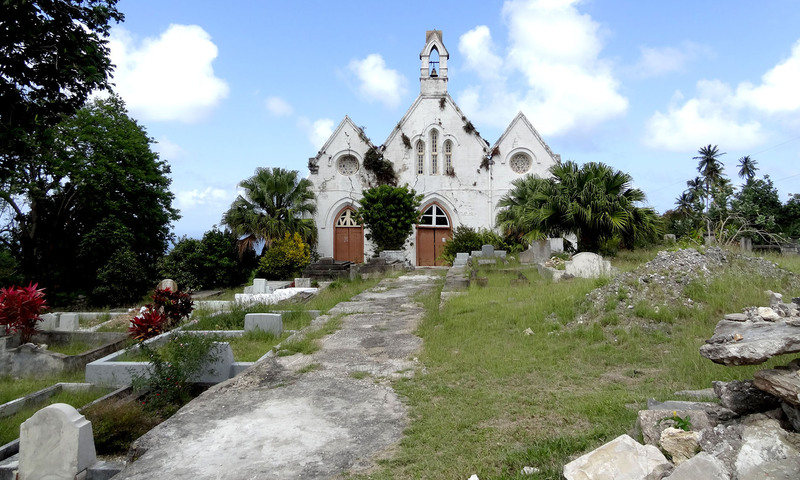 One of the oldest churches on the island, St. John’s Parish Church, was first built of wood in 1645, with sweeping views of the eastern coast. The current church building dates to 1836. Fieldwork recorded 106 monuments in St. John’s Parish Church, with more than 30 internal monuments, including work by famous British sculptors like Westmacott. Stone, coral and granite monuments abound, many of which have large iron enclosures or curbed plots. Unfortunately, land slippage followed by earth tremors in 2007 and Tropical Storm Tomas in 2010 resulted in severe structural damage that eventually forced the closure of the church in June 2011. The site was deconsecrated October 6th, 2011, with plans to leave the abandoned building as ruins and construct a new church nearby. Only 14 monuments dated to the period of study were included in this project, with few monuments surviving from earlier records. The interior monuments had been stripped from the church along with other fittings and ornaments and were not traceable. External monuments from the period of study are concentrated to the northwest and southwest of the church building, with more modern sections extending to the southwest. 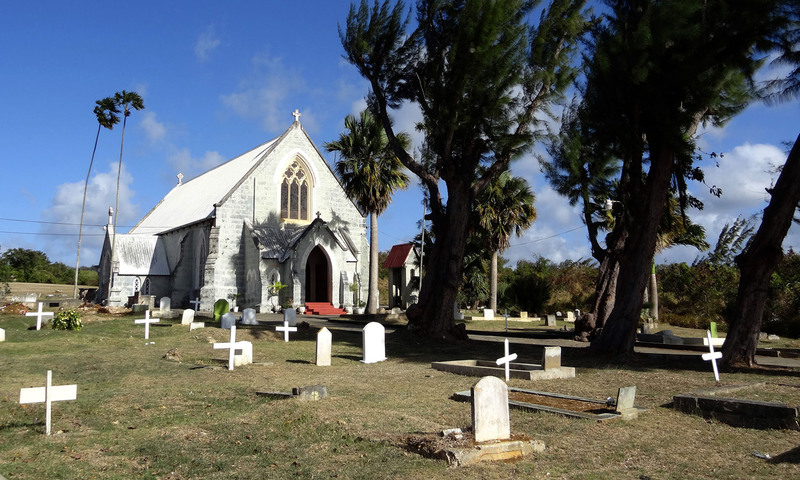 Located on Westbury Road in Bridgetown, St. Leonard’s Church dates to the middle of the nineteenth century when it was established to serve the ever growing population of the main port of the island. The very large churchyard that surrounds a contemporary church building built in 1985 following a massive fire. A total of 129 monuments were recorded in the churchyard during the 2013 fieldwork, most of which date to the nineteenth and early twentieth centuries. Monuments include large mausoleums, chest tombs, and tablets, many of which are enclosed with ornate iron railings. Amongst the original six parish churches established on the island, the northern St. Lucy’s Parish Church was originally a wooden structure built in 1627. The current building dates to 1837, and is one of the largest churches on the island. This study included 100 monuments dating between 1696 and 1950. There are some large mausoleums, but the majority of the monuments are tablets set on large covered vaults and curb enclosures. Many of the original ornate iron enclosures have also survived. Monuments are primarily marble, coral stone and concrete. This is one of the earliest sites of consecrated ground on the island. Originally intended for St. Michael’s Parish Church (later the island’s cathedral), however the original structure was quickly outgrown, and a relocation was carried out. St. Mary’s Chapel was constructed in 1827. The churchyard, which was used for burials predating the establishment of St. Mary’s Chapel, includes 103 monuments dating between 1681 and 1950. 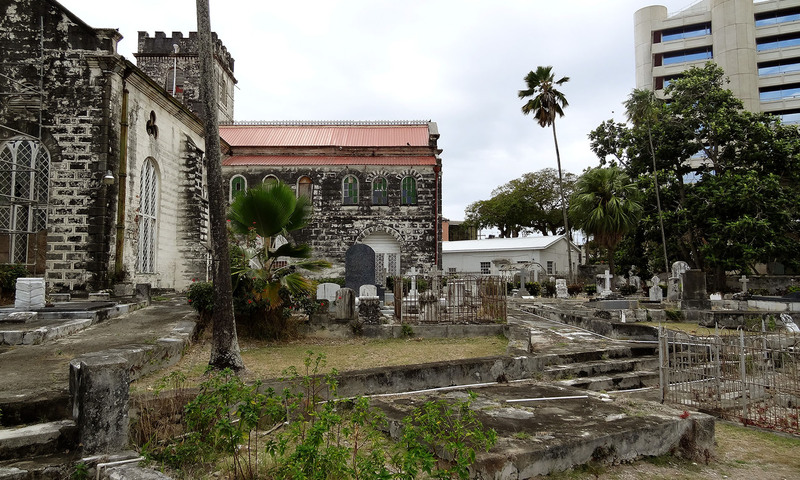 The large mausoleums and covered vaults that characterize this churchyard reflects the cosmopolitan history of the church, including individuals of British, Portuguese, and African descent, with merchants and politicians as well as tradespeople and the military. As early as the 1830s, St. Matthias chapelry district was operating out of one of the parochial schools until a church could be constructed. Built on ¾ of an acre of land in Hastings, Christ Church Parish, St. Matthias Church was completed in 1848. The small churchyard that surrounds St. Matthias church includes monuments that date as early as 1852 and this study includes 21 internal and external monuments. The most famous monument at St. Matthias District Church commemorates fifteen officers and a captain’s steward that died of yellow fever on board the HMS Dauntless. The Cathedral of St. Michael and All Angels, as it is formally known, replaced the earlier wooden Church of St. Michael on the site of what is now St. Mary’s Chapel. At the cost of £10,000, the cathedral was built in the 1780s and designed to have a maximum seating capacity of 3000. The large and very crowded burial ground that surrounds the Cathedral includes more than 649 monuments commemorating deaths between 1660 and 1950. More than a hundred of these occur inside the church, and include extremely elaborate sculptural wall plaques and floor tablets. Destroyed by a hurricane only seven months after it was originally constructed, this church dates to 1833. The well-maintained and serene churchyard that envelopes the Chapel includes 97 monuments dated between its opening and 1950. Most monuments run down the east side of the church, with some in the western section. These have all been painted white in their maintenance efforts and fitting in with the monochromatic colour scheme overall. These monuments consist of some mausoleums, but mainly headstones and chest tombs with some of the original iron gates still maintained. 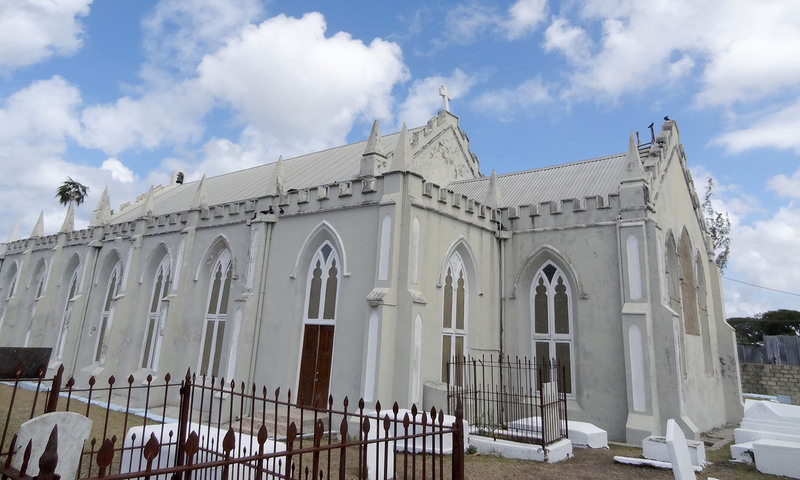 Located in Speightstown, St. Peter’s Parish Church was first built in 1629, though the current structure dates to the 1980s after fire damage. The small churchyard that surrounds St. Peter’s has a concentration of monuments to the west and southeast. This study included 168 internal and external monuments dating between 1677 and 1950. The internal monuments are primarily wall plaques, marble, with simple sculptural elements. Outside, monuments include vaults, mausoleums, and chest tombs in marble, coral stone, and brick. With the Speightstown location, unsurprisingly many of the families represented were engaged as merchants in the busy port town. 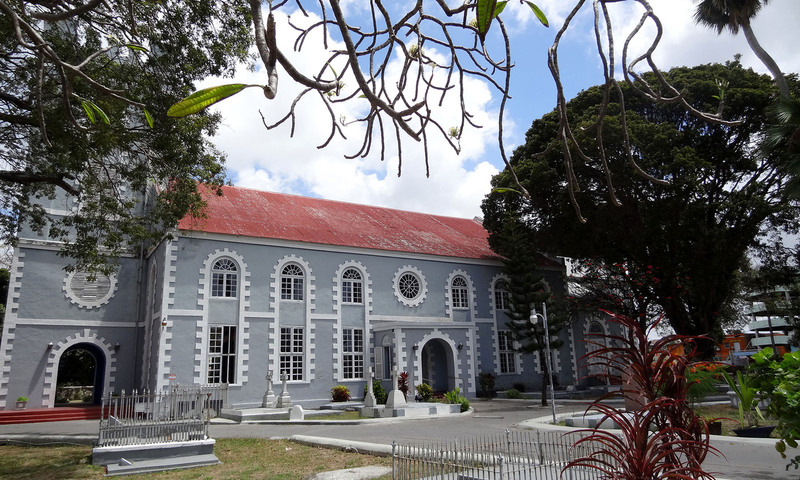 St. Philip’s Parish Church serves the largest parish on the island, originally constructed in 1640 and reconstructed a number of times since then (latest: 1830s with substantial work in the 1970s). Sheltered beneath the silk cotton tree, many large vaults and mausoleums crowd the large churchyard and surround the current church building. This study included 168 monuments dating between 1677 to 1950. The use of coral stone is evident throughout the churchyard, from small grave markers to large mausoleums. Marble, granite, and iron are also common, alongside the use of concrete and concrete block in twentieth century monuments. The Parish Church of St. Thomas, located in Arch Hall District, dates to as early as 1629. 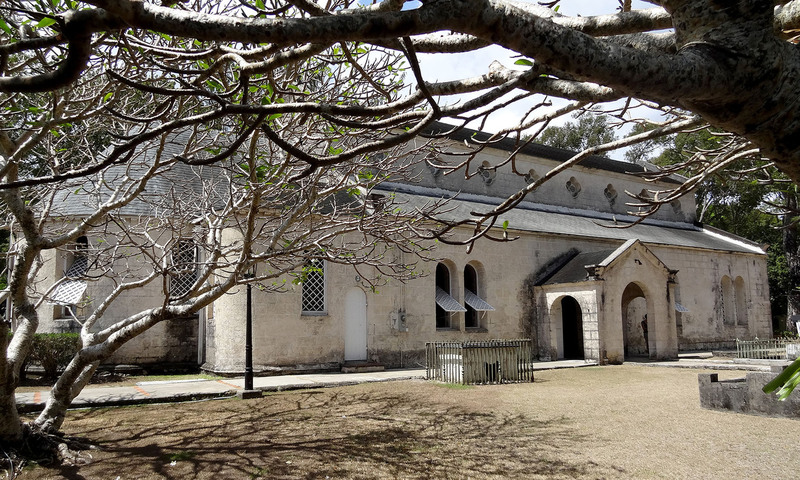 However, like many of the churches on the island, the building has gone through many phases of building and destruction, being hit hard by the hurricanes of 1675, 1780, and 1831. 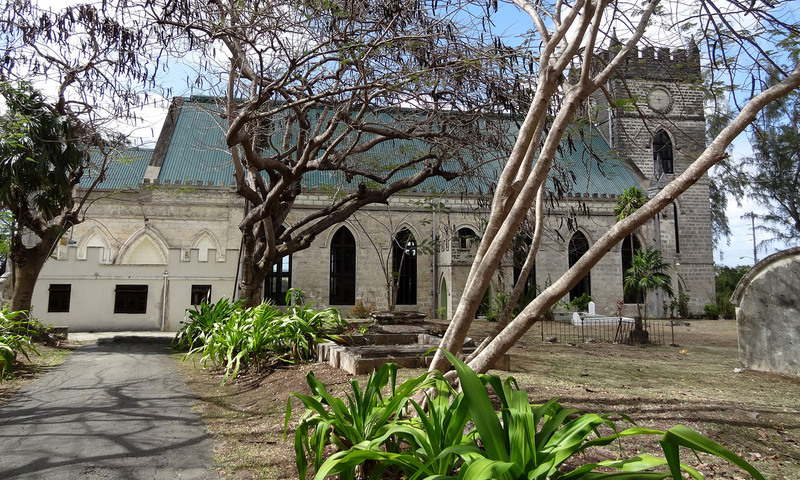 The grassy and open churchyard that surrounds St. Thomas is walled by a large coral stone enclosure and landscaped with tall palm trees. This study includes 71 monuments dated between 1651 and 1950. Large mausoleums and vaults stand alongside small, isolated tombstones. Marble and coral stone abound, in addition to concrete and brick structures. 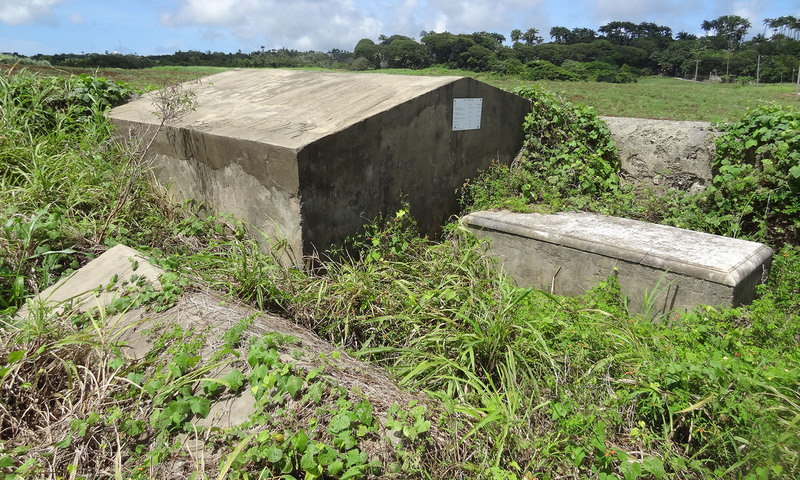 In the midst of a sugarcane field, not far from the road, a high wall surrounds two large mausoleums, two chest tombs, a small, iron-railed plot, as well as a double grave and a single grave used by the Culpeper and Mayers families. The coral stone wall likely dates to the early twentieth century, as it covers over the entrance to one of the mausoleums, and it is suggested that some burials may have taken place in a wider area of the surrounding field. The mausoleums were also constructed of rendered coral stone, with white marble used for the surviving commemorative tablets, one on a chest tomb and the other on the Mayers vault. 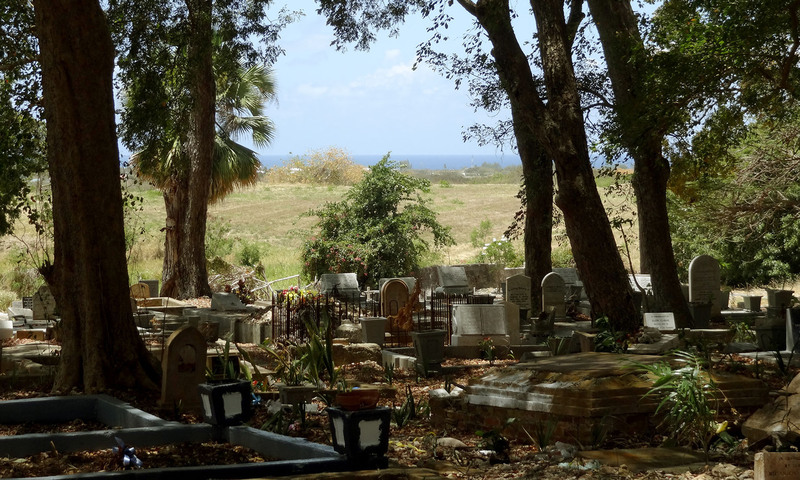 The burial ground was substantially reconstructed and restored in 2009 by the Barbados National Trust, Barbados Museum & Historical Society, members of the Mayers & Culpeper families, and current owners of Easy Hall Plantation. 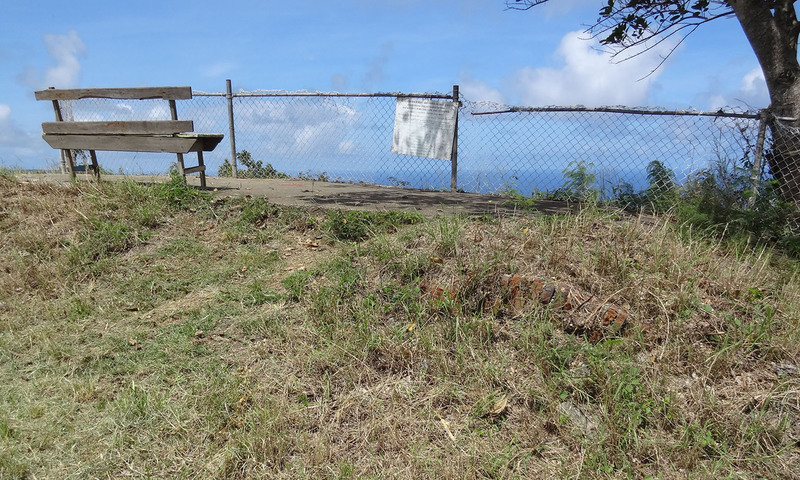 At the edge of Hackleton’s Cliff, the burial vaults on Malvern Plantation have some of the best views on the island, looking over the east coast and Atlantic Ocean. Three brick and coral stone vaults were built side by side (approximately 11m by 3m), only just visible in the grass from the south side, but fully exposed on the north side. The vaults likely date as early as 1685, and some burial records have suggested at least nine individuals were buried here between 1685 and 1826. Malvern Plantation, also known as Rowley’s, overlaps St. John’s and St. Joseph’s parishes and changed hands frequently, but it was likely used by the residents of a few neighbouring plantations. 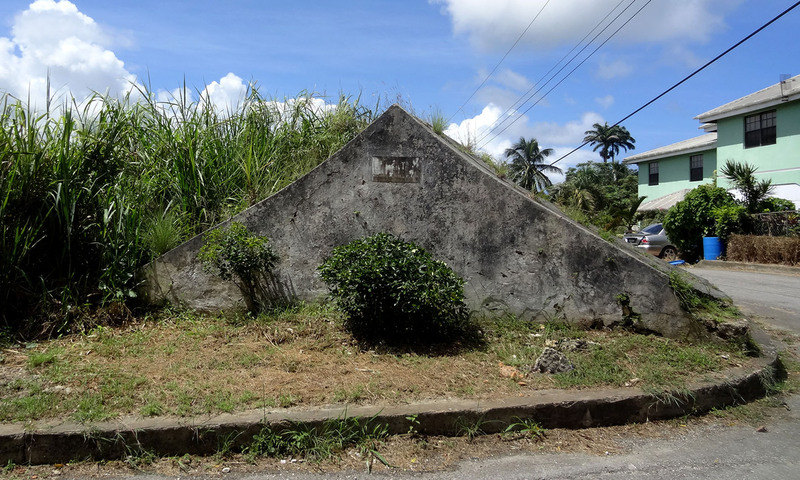 At the edge of Welchman Hall Gully, bordering a sugar cane field, the Williams Vault remains a testament to the Williams family and their plantation. Today, the vault is in a small residential area, and can be accessed via Vault Road. 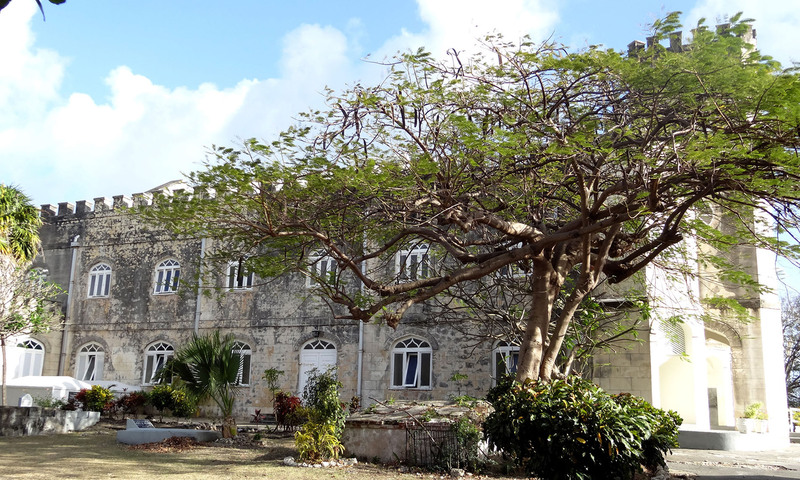 The Welchman Hall Plantation, in St. Thomas Parish, was owned by General William Asygell Williams by 1638. The Williams family had a long history with the location, until 1825 when Thomas Williams sold the 177-acre property with mansion house, mill, boiling house, and 67 slaves to William Grant Ellis for £19,500. The vault was established on the property by 1660, and records suggest that at least eight members of the family, before the 1930s, when most of the Williams descendants emigrated to the US. The St. Philip’s Quaker Burial Ground includes a high walled enclosure, with stairs leading down to six family vaults, labelled P, RW, G, and P. A flat area to the southwest of the enclosure is believed to be the burial ground used for non-plantation owners. Today, the Quaker Burial Ground can be accessed via a residential laneway off of Highway 4b, north of St. Philip’s Parish Church. 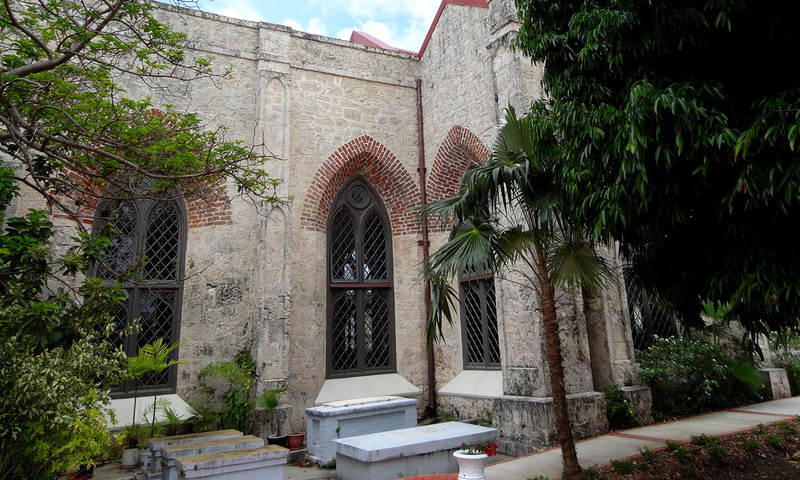 It was restored between 2003 and 2006, with the support of donors in Barbados, England and the United States. Three of the marked vaults have been associated with the Weekes, Gittens and Pilgrim families, with burials taking place here in the 17th and 18th centuries. It has been suggested that Richard Taylor, stepson of Richard Settle, constructed a vault in the coral stone cliff, along with John Gittens, Ralph and Gay Weekes, Robert Pilgrim, and the Jones, Toppin, Griffith and Weatherhead families, establishing this as a Quaker burial ground, c. 1670.